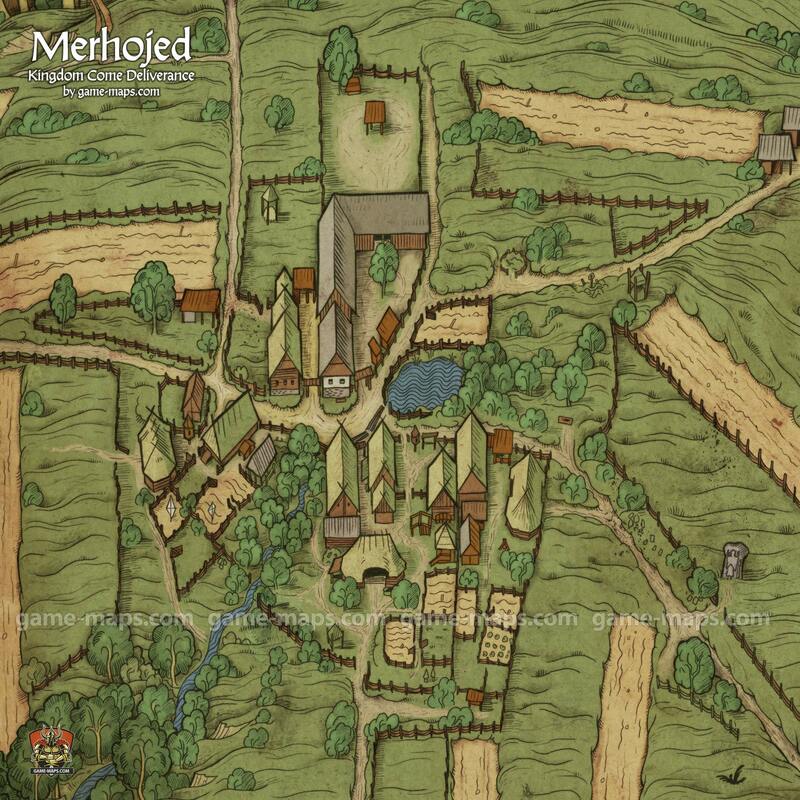 Map of Merhojed in Kingdom Come Deliverance KCD Video Game. Merhojed - A small village near Samopshe which was the property of the Sasau Monastery in the 15th century. The "Stone Man" is an unusual standing stone (or stele) composed of red sandstone with a carving of a warrior with a spear is located at a crossroads in Posázaví, between Merhojed and the field track to Talmberg. According to a fairly unsubstantiated theory, the stele was brought here from the Sázava Monastery when it was reconstructed in the 14th century. The identities of the author of the relief carving and the man depicted remain a mystery. The Stone Man may have been a Slavic warrior or St. Longinus with the Holy Lance (his name is derived from the Greek word for lance) who according to the New Testament used it to pierce the side of Jesus on the cross. In the middle ages, Budin Mill was a supplier of local villages and small towns. In the 17th century it was part of Merhojed, becoming the property of Jan Budínský in 1678, from whom it takes its name. A small village near Samopše (Samopesh), which was the property of the Sasau Monastery in the 15th century.